Lower eyelid bags are not all created equal. For that reason no single approach to lower eyelid bags are right for all eyelids. In many cases, the best surgery for a particular lower eyelid bag may actually be lower eyelid filler or even a chemical peel. Perhaps no other area of facial surgery is so commonly is associated with potential complications that can affect the optimal surgical outcome. For that reason, you need an honest assessment of what is right for your lower eyelid issues by a true expert who is solely motivated by getting you the best possible result. Dr. Steinsapir is that eyelid surgical expert. Lower eyelid is best at addressing herniated lower eyelid fat. It is less ideal for most other types of issues like skin texture. Is your bag caused by herniated orbital fat? That is an essential question and a detailed personal consultation with an eyelid expert like Dr. Steinsapir is the only way to know for sure. If so, lower blepharoplasty can be a perfect choice for you. If you have done research, you may be aware that two methods of eyelid surgery are described: transcutaneous and tranconjunctival approach. The transconjunctival lower blepharoplasty is performed through an incision made behind the lower eyelid. Through this incision, the fat pads of the lower eyelid are approached and can be sculpted into shape to reduce the fullness of the lower eyelid. There are enormous advantages of this method popularized by oculoplastic surgeons. The transconjunctival lower blepharoplasty does not make an incision in the eyelid skin. Therefore, there is no visible scar. To approach the eyelid fat through a skin incision, the lower eyelid muscle is also cut and this can lead to a variety of problems, which will be discussed below. The transconjunctival approach avoids these complications. The transconjunctival lower eyelid surgery provides a direct approach to the herniated orbital fat. A variation on the transconjunctival lower blepharoplasty is the arcus marginalis release. Through the transconjunctival approach, the inferior orbital septum is opened and a small space is elevated just under the tear trough hollow over the top of the cheek. The orbital fat is mobilized on its blood supply and is repositioned just over the edge of the cheekbone as a living pedicle graft. This smoothes the bulge of fat in the lower eyelid and fills the hollow at the top of the cheek. Transconjunctival lower eyelid surgery is not associated with a skin scar and avoids a number of lower eyelid issues associated with transcutaneous lower eyelid surgery. Transcutaneous lower blepharoplasty is also a popular surgical approach to the lower eyelid. Unfortunately, it is far more commonly associated with complications. Surgeons offer a variety of rationales for persisting in the use this surgical approach but these reasons are largely discredited. The reason we still have this surgery is that many surgeons are not comfortable working close to the eye surface. Surgeons continue to lecture, publish papers and run teaching courses on this type of surgery. Despite this, transcutaneous lower eyelid surgery is a leading cause of problems after eyelid surgery. Not all who have transcutaneous lower eyelid surgery develop a complication. Dr. Steinsapir estimates that as many as 30% of individuals who have transcutaneous lower eyelid surgery will have issues with this approach. Many of these will resolve without revisional surgery but some will require lower eyelid revisional surgery to address unsatisfactory issues. To understand why this is so, consider the anatomy of the lower eyelid. The lower eyelid is suspended from one edge of the orbital rim to the other. The eyelid functions as a windshield wiper to move tears over the corneal surface. This protects the eye surface as well. To function properly, there is a layer of muscle just under the skin called the orbicularis oculi muscle that is responsible for supporting and moving the eyelid. At the eyelid margin, this muscle is thicker and functions to hold the eyelid margin against the eye surface. This is important because the lower eyelid has to fight the effects of gravity. The relationship of the orbital rim to the lower eyelid is of critical importance. In faces where the orbital rim and cheekbone are not as strong, the muscular hammock of the lower eyelid is even more important for holding the eyelid against the eye surface so it can do its job. Behind this muscle is a thin layer of connective tissue called the orbital septum, which separates the orbit from the eyelid. The fat, which herniates into the lower eyelid to make a “bag” in some individuals, lives behind the orbital septum. Now consider what happens when a surgeon performs a transcutaneous lower blepharoplasty, or cosmetic lower eyelid surgery through a skin incision, also called an infraciliary incision. To get to the herniated orbital fat, that incision is made through the lower eyelid skin just below the lower eyelid lashes. It is also made through the muscle and the septum sitting behind the lower eyelid skin. The surgeon then removes the herniated orbital fat or the fat can be transposed and moved into the top of the cheek to filler a tear trough hollow. Often “excess skin and muscle” are then trimmed from the lower eyelid to remove lower eyelid skin wrinkles and the incision is then sewn closed. This incision is highly disruptive to normal lower eyelid anatomy and function. The roll of orbicularis oculi muscle that lives at the edge of the eyelid is responsible for making a muscular hammock that holds the margin of the eyelid against the eye and is profoundly weakened. The motor nerves that supply this muscle are severed by the infraciliary incision. This permanently weakens the lower eyelid and causes it to slump or slide blow its natural position. As the lower eyelid heals, scar tissue that develops in all layers of the eyelid also contributes to the downward pull on the lower eyelid. Of course, if too much “extra skin and muscle” are removed at the time of lower eyelid surgery, this also makes the situation worse. In an effort to mitigate the risk of the lower eyelid being pulled down, many surgeons who perform transcutaneous lower blepharoplasty perform routine canthopexy at the time of the surgery. Canthopexy involves placing a deep stitch between the outer corner of the eyelid to the lateral orbital bone to support the eyelid. Unfortunately this stitch can distort the tissues further contributing to post-surgical changes. See the page for fixing botched lower eyelid surgery to see what these eyelids can look like and how Dr. Steinsapir fixes them. Another problem with the transcutaneous lower blepharoplasty is the loss of the muscle roll at the lower eyelid margin when “excess skin and muscle” are removed. The dramatic and disturbing change in the appearance of Renee Zellweger is partially caused by the removal of this muscle roll. That roll of muscle is actually aesthetically important. The South Koreans have a name for this: the love band. They have surgeries for increasing the prominence of the love band. Certainly it is important to carefully consider surgery on this structure because of its aesthetic importance. Dr. Steinsapir is a firm believer that the best way to get out of trouble is by staying out of trouble. The transconjunctival lower blepharoplasty does not have the level of complications associated with the transcutaneous lower blepharoplasty. Yes, the surgeon must be comfortable working near the eye but Dr. Steinsapir a board certified ophthalmologist and fellowship trained oculofacial surgeon so he has all the skills needed to comfortably and safely perform transconjunctival surgery. There are individuals who have excess lower eyelid skin and wrinkles. Something more is needed to address these eyelids other than just performing transconjunctival surgery. This can be a skin pinch, were the bulk of the work is performed behind the eyelid but only a pinch of skin is removed in the front of the eyelid. Another alternative is what is known by surgeons as a biplanar lower eyelid surgery. This can be very helpful for addressing lower eyelid festoons at the time of the lower transconjunctival blepharoplasty. The approach here is to use the transconjunctival arcus marginalis surgery behind the eyelid to deal with herniated orbital fat and improve the lower eyelid hollow. An anterior, infraciliary incision is made just through the skin leaving the underlying muscle intact. A limited vertical midface lift procedure can be performed through this. Skill, experience, and wisdom are needed to get the best possible result with the lowest risk of potential complications. 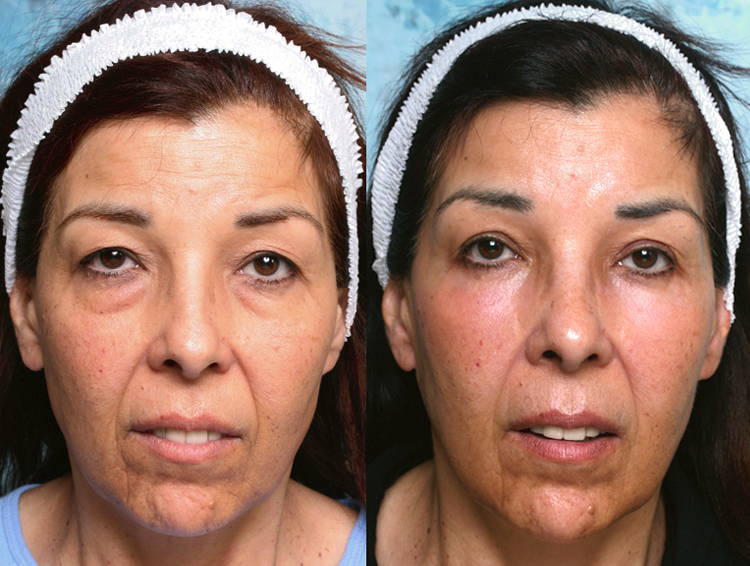 Combining transconjunctival lower blepharoplasty with a chemical peel is an excellent option for many individuals. Dr. Steinsapir is a master chemical peeler and he can design and tailor a chemical peel that will be right for you. This can be performed at the time of your lower eyelid surgery. Upper and Lower Eyelid Surgery. Also known as a quadrilateral or four (4) eyelid blepharoplasty. For the right individual, it is common to have surgery performed on all four (4) eyelids. The key is getting appropriate surgery. At the time of your personal consultation, Dr. Steinsapir will carefully assess you and honestly share his opinion regarding what he feels are the best options for you. Under Eye Fillers – An Alternative to Lower Eyelid Surgery. For many people a properly performed under eye hyaluronic acid filler service is an excellent and viable alternative to having lower eyelid surgery. Many who choose this route simply do not have seven (7) days for down time in their schedule to have eyelid surgery. Dr. Steinsapir will discuss with you if his under eye filler service is an appropriate alternative to lower eyelid surgery for you. Lower Eyelid Surgery After Under Eye Fillers. Some surgeons advertise performing lower eyelid surgery to correct issues with under eye fillers. Dr. Steinsapir believes that there can be a good reason for taking this approach when a permament filler has been used and has caused a problem. However, most individuals who consult Dr. Steinsapir for a second opinion are simply overfilled with hyaluronic acid filler. While surgery is an option, many individuals with these issues do best to have their old filler removed and carefully replaced with a more artful filler service postponing the need for surgery. After all, why have a surgery if you don’t need one? Dr. Steinsapir performs his surgery in two locations. For most patients, he performs their surgery in the private, state of the art, accredited surgery center that has operating rooms that are located in his beautiful Beverly Hills Office. The other location he performs surgery is the Surgery Center at the UCLA Ronald Regan Medical Center on the UCLA Campus. Generally this center is used for patients who want cosmetic surgery but have more significant health issues. For others, they love the privacy and convenience of the surgery center in Dr. Steinsapir’s office. Not every surgeon has his/her own accredited operating room. They may pressure you to have your eyelid surgery under just local anesthetic in an unaccredited procedure room. That may not be right for you. Most patients benefit from some degree of sedation, even if brief, to make surgery comfortable. When sedation is not available, you will be more aware of the work that is being performed and the injection of local anesthetic. Some can tolerate this discomfort, but it is so much more pleasant to be properly sedated. Your comfort and safety is our foremost concern. In addition, the certification of the surgery center assures you that appropriate quality assurance standards are met in all aspects of your surgical care. Dr. Steinsapir is very proud of the quality standards met by his office and surgery center. Request a tour when you are in the office. There are very few centers that are as clean and modern as Dr. Steinsapir’s office and surgery center. Dr. Steinsapir of LidLift and his staff will also discuss with you prior to surgery what you need for your recovery. This is very important. For those who are coming from out of town, and travelling alone, they may need a night nurse for one or two nights or in some cases, a recovery hospital will be recommended. For those traveling with loved one’s, in most cases your family member or friend can serve as your night nurse. For individuals who live in the area, they have the option of recovering at home, but in some cases it may make sense to stay within a short distance of the office for the first night or two. These are details that will be discussed with you based on your circumstances and the exact nature of the surgery that is planned.